"Mayo does brilliant job combining the known facts of the Mexican Revolution and Madero's role within it, and creates an intellectual bridge to the president's spiritist belief structure...With her translation of the Spiritist Manual, C.M. Mayo opened this incredible window into the metaphysical side of the Mexican Revolution"
"Ever astonishing are the greats whose inner tracks wholly diverge from their renown. 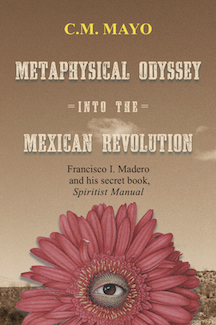 Such a case is Francisco I. Madero, first president of Mexico after the 1910 revolution, whose political genius was immersed in mysticism, and equally extraordinary is C. M. Mayo's account of this paradox in Metaphysical Odyssey into the Mexican Revolution. Threading the tortuous path of Madero from birth to assassination, and culminating in the first translation into English of the little-known Spiritist Manual of this master of statecraft, Mayo's account brings to life the duality of the singular founder of Mexican democracy." In a blend of personal essay and a rendition of deeply researched metaphysical and Mexican history that reads like a novel, award-winning writer and noted literary translator C.M. Mayo provides a rich introduction and the first English translation of Spiritist Manual, the secret book by Francisco I. Madero, leader of Mexico's 1910 Revolution and President of Mexico, 1911-1913.